Costa Rica is a beautiful country with a lovely climate. 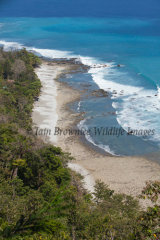 There are many interesting areas but we chose to travel to the Panama Border and the Osa Peninsula in the south west. The Osa retains its rain forests and exotic wildlife. There are lodges around the southern edge of the Osa which offer easier trails. It is worth checking if they allow you access without a guide to the trails. 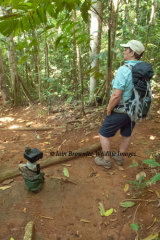 The main reserve (Corcovado NP) is serious rain forest with few comforts. The climate is fairly hot and humid but many of the lodges catch the breeze off the sea in the evenings. Wildlife diversity levels are high and you can sometimes see a puma walking through the lodge areas. Puerto Jimenez airfield can be reached from the capital San Jose (Pavas Airport). San Jose is a large city with good roads but it is worth being met at the International Airport as navigation through the back streets can be difficult, particularly at night.